Christmas is 'the most wonderful time of year'. Everyone is getting into the spirit of festive and cheer, and towns and villages throughout the county are decorated and illuminated by Christmas lights, creating a special atmosphere which only this time of year can generate. Yet yuletide can be a stressful one as we rush around the shops looking for gifts for family and friends. But what do you get the person who has everything this Christmas? A Pallas Karting Christmas gift voucher of course. From go karting to paintball campaigns courses, Pallas Karting Centre has everything to challenge the ultimate competitor of the family. A Christmas gift voucher for Pallas Karting Centre for your loved one will definitely have you in the good books. With Europe’s largest and best outdoor kart centre, an advanced 1500m track and 85kph Thunderkarts, The MotorSport Ireland and NKA approved track in Tynagh, Loughrea, also has a beginners track so you do not have to be a Formula 1 driver to get behind the wheel. Offering the biggest track, the longest laps, and the best go karts, the Pallas Karting racing experience is one not to be missed. And after you have finished doing your best Lewis Hamilton impressions, why not keep the adrenaline rush going as you test out your shooting skills with Pallas paintball and splatball. It has Galway's only paintball and splatball centre, with four specially designed game zones. Designed with both the beginner and the experienced campaigner in mind, Pallas Paintball Galway enables you to bring Call Of Duty to life and is perfect for stag, hen, or birthday party activities. But if paintball is a bit too intense, why not try splatball; a lower velocity version of paintball using lower powered guns and smaller paintballs. It is great for families and ideal for children's birthday parties. All safety masks, commando overalls, chest guards, and gloves are also provided. So this Christmas, treat your loved one with a Christmas gift voucher from Pallas Karting where everyone is guaranteed a great day out. 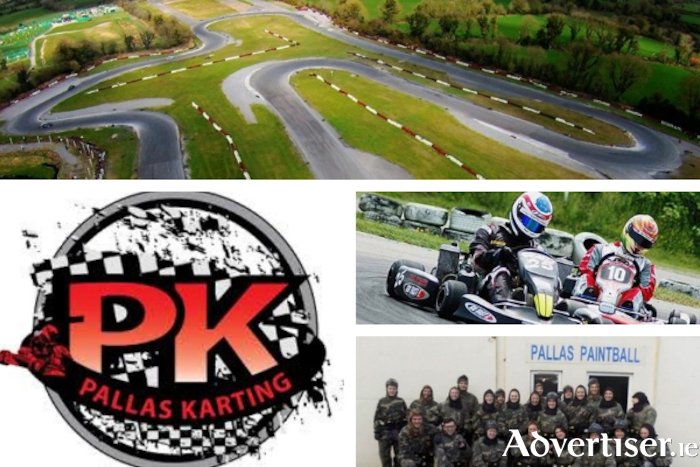 For more information or to purchase a Pallas Karting Christmas gift voucher, visit www.pallaskarting.com, check out Facebook page www.facebook.com/pallaskartinggalway/, drop into Pallas Karting, Tynagh, Loughrea, Co Galway. [Closed]WIN a €1000 design package voucher for any startup or well-established business!